What does your body temperature suggest about your health? I’ll also add to that list a warm body and the ability to generate efficient energy, a phrase biologists might use is a state of negative entropy. Entropy is a state associated with decay and disorder and as entropy increases, equilibrium is achieved - where a state of no energy in and no energy out or death of a living system occurs. The basis for life and metabolism is governed by the enzymes. Enzymes function well in an appropriate temperature and in a medium that is neither too acidic nor too alkaline. 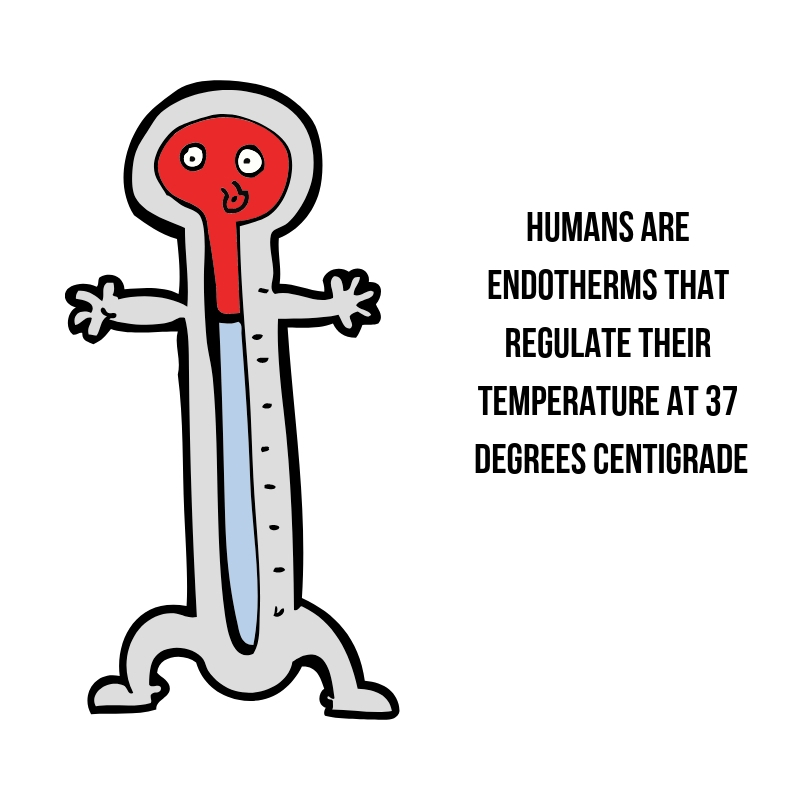 Mammals and specifically humans are endotherms that regulate their temperature in tight range at approximately 37 degrees Centigrade (C) or 98.6 Fahrenheit (Bicego, Barros, & Branco, 2007). The central compartment theory of temperature suggests that the head and the core should maintain a relatively stable temperature, due to the rich vascular supply and that the periphery may vary some 2-4 C.
In a recent study that I conducted I suggested that the peripheral and core temperatures should remain at a similar level of about 37 C . The suggestion that a decreased body temperature recorded in the head, might be the last place that you would see a reduction due to the large quantities of glucose that the brain uses to maintain function. It’s possible to suggest that the slowing of function in low energy and hypothyroid states might be observed initially in the trunk or core. The well documented symptoms of constipation, decreased heart rate, slowed contraction relaxation of the heart and arteries and reduced peripheral relaxation of tendons (Achilles tendon reflex) might appear in the trunk and peripherally due to the preferential oxidation of glucose initially. Due to the vast systemic implications of low thyroid function, many different paths of decreased function might occur, dependant on nutrition, environmental stimulus and other stressors. In my study I didn’t find this but what I did find is strong linear correlations between low body temperature in both the mouth and armpit, multiple low thyroid symptoms (mean 6.8 per subject) and yet normal blood values. Adequate energy, maintains body temperature and organises tissues to function at their best. Negative entropy state. From an evolutionary perspective fasting due to lack of food was a necessity. Fasting these days could be a useful tool, if you were prone to constant overeating but if your system lacks the flexibility to do so problems can occur. That’s not to say that calorie restriction for weight loss isn’t helpful but sustained CR in a system that doesn’t respond well might be counterproductive. Pollution has increased at a phenomenal rate clearly affecting physiology and hormones (Gore et al., 2015). Does it make sense that a so called detox diet, low in calories, protein, carbohydrates can enhance the function of detoxification, when liver function is energy and thyroid dependant? Skipping breakfast alone in some is associated with increased cortisol, glucagon and metabolic inflexibility (Jakubowicz, Wainstein, Ahren, et al., 2015) (Jakubowicz, Wainstein, Ahrén, et al., 2015). These factors can also decrease the mitochondrial uncoupling proteins which are responsible for increased body temperature. Certain nuances exist in temperature regulation that are dependant on acute or chronic exposure to stressors and a slowing down of the system through a functionally, subclinical or overt hypothyroid state. In short term fasting, TSH is initially raised then decreases, negating thyroid blood tests. In the same manner the time frame of any stressor can dictate whether short or long term compensations of the sympathetic adrenergic system is supporting the system. In well established feedback mechanism it’s known that as TSH increases so does cortisol and as body temperature approaches hypothermic levels (around 35C) cortisol, adrenaline and noradrenaline can increase body temperature as a protective response. In a world where excess environmental and social stressors are ever increasing - it might make sense to maintain an efficient, organised warm body rather than reducing its function and heat. Older PostBetter gut health with less bacteria?